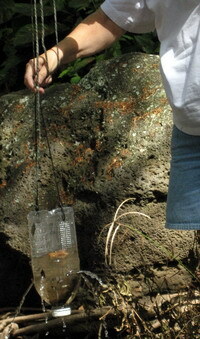 This is a simple way to catch small fish, like guppies, mosquito fish, minnows, etc., in a shallow stream. with a home-made transparent fish strap. 2. Approx. eight feet of light twine strong enough to suspend 4 pounds of weight. 2. Leave the cap on the bottle. 3. Cut two holes half-way down the side of the bottle, about 1/4 inch in diameter (about pencil thickness). These are drain holes to lower the water level to prevent the caught fish from jumping out. 4. Cut two holes 1/2 inch from the bottom (cut) end of the bottle. This is to tie on a loop of twine. 5. Tie a 20 inch piece of twine to the two holes in step 4 above. 6. Tie the remainder of the twine to the center of the loop in step 5 above. 1. Locate the fish, usually near shore where there is a quiet eddy. 3. 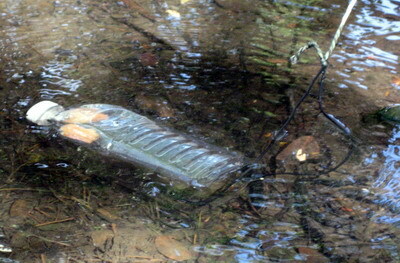 Place bottle on its side on the stream bed under water with the cut bottom facing upstream. The water should fill and cover the bottle. 4. Place twine leading to the shore where you can see the fish but not to cast your shadow on the water. 5. 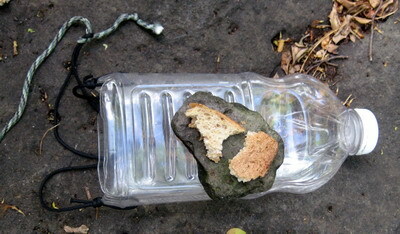 Place a small piece of bread into the bottle toward the bottle cap. 6. Step back and wait for the fish to nibble on the bread. You can toss tiny pieces of bread close by to attract them, but not too much. 7. 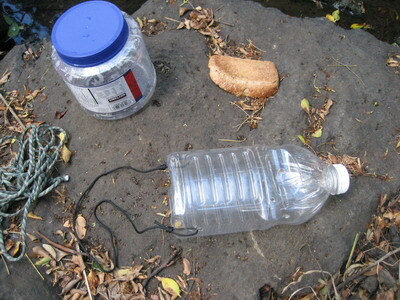 Once the fish enter the bottle, swiftly but carefully pull the twine upward so the bottom of the bottle is out of the water. 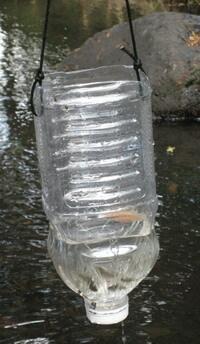 The extra water will exit the side holes and the fish will be caught in the lower half (cap end) of the bottle. 8. 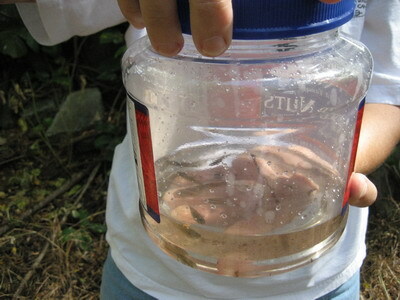 Empty the fish into a holding container (pail or big mouth bottle). CONGRATULATIONS !! You just caught a mess of fish. 9. Reset the trap and catch some more! 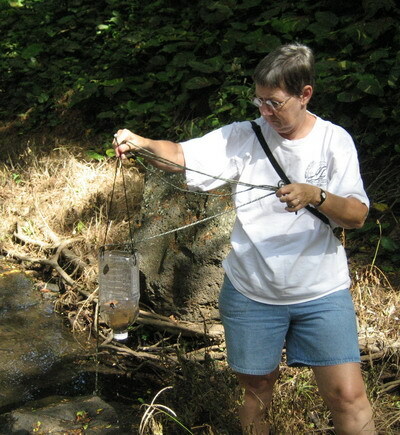 I use this method to catch stream fish to stock a small aquarium display of local fish. In a few minutes, I can catch several dozen fish. Please keep only as many fish as you can care for adequately and return the others to the stream. You can use this method with kids as a "catch and release" exercise. Kids love it. But please emphasize good conservation practices and respect for other living things.